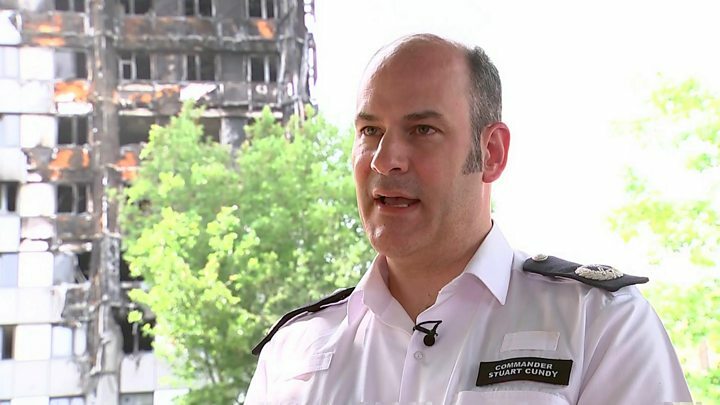 Media captionCommander Stuart Cundy: "We are absolutely determined"
The Metropolitan Police believe there were about 255 survivors from last month's fire at Grenfell Tower. Police say "extensive investigations" led them to conclude 350 people should have been in the Kensington tower block on the night of the blaze on 14 June. That night, 14 residents were not in the building, leaving at least 80 people dead or missing, the Met said. Detective Chief Inspector Andy Chalmers, leading the Met's operation, described the task as "unprecedented". In the update to its operation, which includes a criminal investigation into why the fire began, police said the coroner had formally identified 32 bodies. "You can't listen to the families and to the 999 calls and not want to hold people to account for a fire that should not have happened," said Metropolitan Police Commander Stuart Cundy. Speaking after the briefing, Cdr Cundy denied claims from former residents and politicians that the number killed in the tragedy could be far higher than 80. "We've been working tirelessly to ascertain how many people died in the fire," he said, describing the night as one where "the lives of so many changed forever". Labour MP David Lammy told BBC's Newsnight in June that he was "sympathetic" to the view that the number of dead was being covered up. Why is it taking so long to name victims? Scotland Yard believes around 10 people managed to escape the tower "but for a number of different reasons" were not willing to come forward. The government has promised not to conduct immigration checks on survivors and those coming forward with information in a bid to aid the investigation. It has also said tenants illegally subletting flats in the tower would not face charges. Cdr Cundy said the Met's investigations would "not be hampered in any way" by a separate judge-led public inquiry into the blaze. "We are absolutely determined to do everything new can to identify what offences have been committed," he said. "We will seize information for wherever it comes from." Detectives said they were looking at "every aspect of fire safety" at Grenfell - including fire doors, exit routes and emergency procedures. So far, 140 witnesses have been spoken to, with plans to interview the 650 firefighters and 300 police officers involved in the rescue operation, and all residents. The retired judge leading the public inquiry, Sir Martin Moore-Bick, said it would seek to discover the truth about what happened at Grenfell Tower, "so that we can learn lessons for the future". Sir Martin recently held a meeting with residents also attended by the Met. The first public hearings are expected to be held in September. Since the fire, the claim that 150 or more people lost their lives has persisted. After all, there is no official register of those living in the tower and a list provided by Kensington and Chelsea Council has proved to be inaccurate. As a result, it was crucial that police worked out how many people should have been in the tower that night. Their estimate of 350 is far fewer than the 500 to 600 people claimed by some. And 14 people, police say, were out for the night. Police also say that many of the flats were not family-sized, but one or two-bed properties, which may explain the belief that more people were living there. It has also been said that sub-letting may have resulted in the tower having a "hidden" population. Police have identified 10 people who didn't want to come forward to confirm they had survived. The police have repeatedly explained their methodology, which has not been challenged. Unless major flaws are found in the way detectives have attempted to get the truth, its likely the final number of dead at Grenfell Tower will be around 80. Cdr Cundy said the Grenfell investigation was "probably one of the biggest investigations the Metropolitan Police has conducted outside of a terror attack". There are 250 specialist investigators working on the Met's operation, including the process of identifying those who died, and finding out how the fire started. Scotland Yard said forensic pathologists were sieving through debris in the building to look for human remains. "Phase one" of the operation - removing identifiable bodies - has now been completed. All remains have been scanned for objects which may be used to identify victims, such as surgical implants, personal jewellery, glasses and teeth. Cdr Cundy said officers involved "can't help but have an emotional attachment to this case". The police investigation into the causes of the fire is also continuing, including an examination of "all criminal offences that may have been committed".